Several researchers at USU are collaborating with Intel Labs to conduct their research in a 3-D virtual environment. Biology doctoral student Arron Duffy is using ScienceSim, a “virtual land-grant” program offered by Intel, to model how population genetics are affected by the unique life cycles of fern plants. Lee Mason, coordinator for the Office of Special Education Programs and a Ph.D. student in curriculum and instruction, is working with Peter Blair, Ph.D. student in instructional technology and learning sciences, to develop a program to train special education student-teachers at distance education sites throughout the state. Mason and Blair plan to use OpenSim as a way to role-play common, but sometimes difficult, situations that special-education teachers encounter. “We found that we could give student-teachers experience that they would not have otherwise received in distance learning sites, like Blanding or Toole,” Mason said. The OpenSim technology will be used to simulate meetings that teachers would have with parents and other educational professionals to coordinate their efforts in individual special-education students, Blair said. Mason and Blair initially used “Second Life” to remotely train tutors for the Bridgerland Literacy program. They are now in the pilot stage of their special education application for the technology. 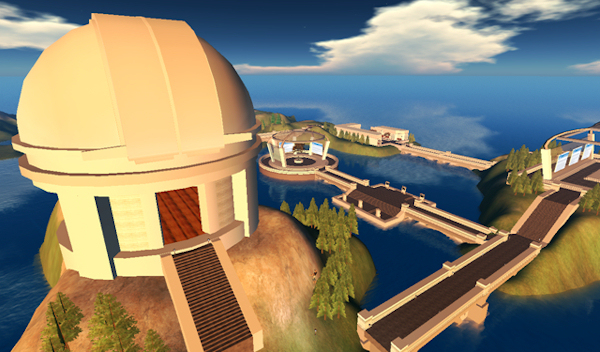 Before they were introduced to ScienceSim by Duffy, they had purchased 16 acres of virtual property from “Second Life” for more than $1,500. They were able to do so through a federal grant from the Office of Special Education Programs. ScienceSim will allow them to test the feasibility of their project for free before purchasing server space of their own. Also, according to the Fashion Research Institute, Inc., it is a more professional and controllable working environment than “Second Life”, which was a concern for Mason and Blair. Similar to “Second Life”, OpenSim creates a 3-D computer-generated world that can be explored by a user’s avatar, controlled remotely from any computer. The ScienceSim land-grant program offers 18 plots of virtual land that are given to educators, scientists and researchers to use for six months at a time for no cost. Participants include Louisiana State University, Arizona State University Law School and commercial researchers, such as Adobe. Duffy came across OpenSim while he was searching for a program that he could use to mathematically model the reproduction of fern plants to learn more about population genetics. He found that by using OpenSim, he could create virtual ferns that would simulate the growth and reproduction patterns of real ferns. The simulation is a simplified model of what may happen in a real forest. Using this simulation, environmental parameters – such as altitude, humidity, wind and quality of soil – can be controlled. The genetic makeup of the fern can also be predetermined and changes in those genes can be observed over many generations. The genes that are programmed into the ferns determine how they react to conditions in the environment. The speed of research can also be accelerated. In Duffy’s virtual world, a day passes by in five minutes, allowing him to observe years of genetic evolution in a matter of days. Duffy’s work was recently featured in the opening address of SuperComputing 2009, an annual high-performance computing conference attended by nearly 11,000 people. Intel’s chief technology officer decided to use Duffy’s research as an example of the challenges facing the future of the Internet. Duffy demonstrated his research sitting at his desk in Logan, while his avatar in ScienceSim was projected on a huge screen in front of the audience in Portland, Ore.
ScienceSim allows for many experts to contribute to projects. ScienceSim also helps organizations to scale up their projects, by utilizing Intel’s larger computing power where they were previously unable because of the high cost hosting such a large application. Initially, using OpenSim on his personal computer, Duffy was able to host enough space to grow several hundred plants, but when he was able to use Intel’s servers, his capacity increased to hundreds of thousands. ScienceSim is also mutually beneficial for Intel. The public is free to explore the projects in the world of ScienceSim for itself by downloading the free software and creating an account at www.sciencesim.com.